Match has just launched a new feature called the Super Match Badge (currently in the UK only), allowing women to award men who check off all parts of Match’s profile and behavior requirements. The purpose of the badge is for women to immediately identify great candidates who they might want to meet. Match is making an effort to appeal to women who have had to deal with less-than-tolerable behavior from men over dating apps. Many online daters have complained about ghosting and sending inappropriate messages and photos, and this is Match’s way of addressing the issue. It’s also a good strategy for men who use dating apps – you can set yourself apart from the crowd. Filling out a Match profile. Specifically, you must complete at least 70 percent of your profile to move to the next step. This means a recent photo, guys! Adding a photo helps with transparency in a user’s profile, and also leads to more matches and responses. Match has created four dating tutorial videos to help men improve their dating game, including how to make a good first impression, how to have a good conversation, how to get to know her better, and “taking it to the next level.” By watching and learning from these tips, the hope is that men will also feel more confident and be more respectful when they meet potential matches. Signing the Match Hero Charter. Basically, you agree to act respectful on the app. These first steps must be completed to obtain the first level Match Badge. More steps are required to obtain the Super Match Badge, including writing a personal ad that helps users get to know you. The last step is the trickiest, but also the best qualifier. If you are a woman using the app and get matched with a man who’s vying for the honor, you can interact with him over the app and decide if he deserves it. If he does, you can award it to him. In case you need some pro tips on what constitutes a real online match winner, the first qualification is that he’s transparent and genuine. He doesn’t try to impress you so much as he’s honest in his profile and in his ad. He’s taken the time to fill out all of the criteria instead of leaving things ambiguous. He takes the time to read your profile and ask related questions. He also acts respectfully, which means first impressions matter. And regardless of how interested you are in a romantic relationship, he remains respectful in his interactions with you. With features like these it is no wonder data from a Research Now survey done in 2018 shows 1.6 million people in the UK met their partner on Match. 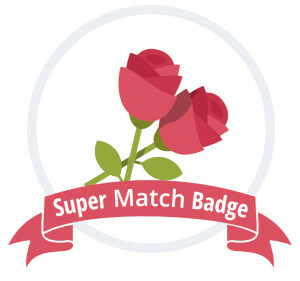 The new Super Match Badge is a bold step toward curbing bad online dating behavior, and is one to watch. It's now available in the UK on Match.